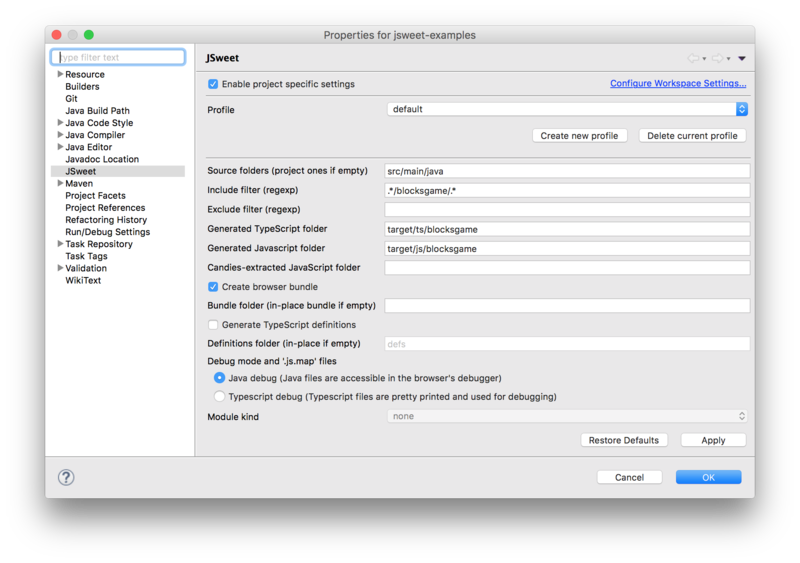 In this page, we step through the creation of a JSweet program in Eclipse, using the JSweet Eclipse plugin (see also on Github). Note: under Eclipse, you can also use the excellent SDBG plugin to debug your JSweet application with the debug perspective. Under Eclipse, go to: Help > Install New Software. Press the “Add…” button to add the JSweet.org update site. Follow the installation instructions (keep the default options) and restart Eclipse when prompted. Right click on your newly added project: Configure > Enable JSweet builder. Clean the project: the target/js should be populated. Right-click on webapp/index.html and choose Open with > System editor. If successful, your browser should popup an alert. Read the following sections to get some hints on how to write JSweet code. Create a new Java project: File > New > Java Project. Name it “jsweet-tutorial” (for instance). Press the “Finish” button to keep the default settings. Right click on your project: Configure > Convert to Maven Project. Leave all the default options. Edit your pom.xml to add the JSweet repository. Note that this step will not be mandatory in the future, when JSweet will be available in Maven Central. In the dependencies section of the pom.xml (at the root of your Java project), add a dependency to the core JSweet library (a.k.a. candy). This will add the JSweet core APIs to your classpath. Right-click on the src folder of your project and choose: New > Class. 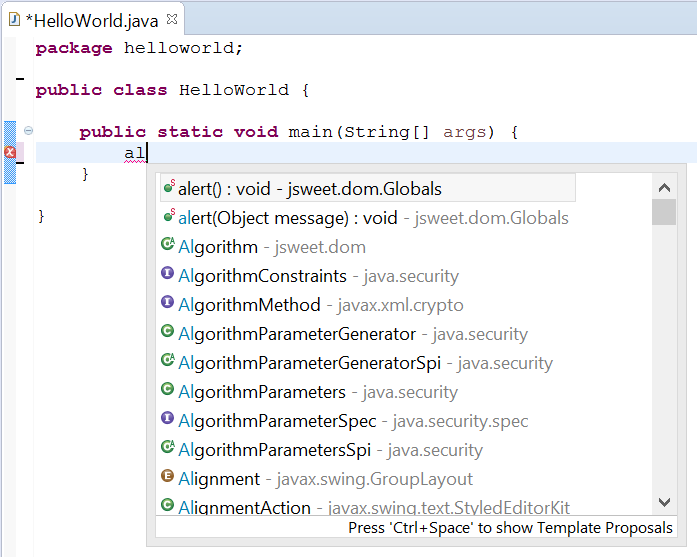 As shown in the following screenshot, create a HelloWorld Java class in a helloworld package. Check the “create main method” option. In the main method, type in al and press CTRL+SPACE. If correctly configured, the alert method of jsweet.dom.Globals should be proposed by the auto-completion (JSweet adds some favorites static members automatically, so that you will get completion on globals such as alert() or document, as shown in the screenshot below). Now, with the help of completion, write the following JSweet program, which will set the content of a div to “Hello world!” with first warning the user. Then, create an index.html file in the helloworld package, next to the HelloWorld class. We recommend that you use version of Eclipse for Web developers, or that you install the Web Developer Tools plugin available at the Eclipse’s market place. Finally, open this HTML page in your favorite Web browser: right-click on the HTML file and choose Open with > System editor. If successful, your browser should popup an alert and show “Hello world!” in the page. If this went well, congratulations! You can now play with more complex examples. You can also read about more details on JSweet design and how to use its APIs.